Research shows that you can add more muscle and lose more fat when you have a structured exercise plan. If you don't have one, you need to get one! You've see them in the gym every day: The people who seem to just wander from one machine to the next, one free-weight exercise to another, with no apparent plan. Hats off to them for showing up, but new research suggests that there can be a world of difference between just going to the gym and going to the gym with purpose. Group 1 was given free access to a fitness center, received no instruction, but met once a month with exercise professionals to discuss their progress. Group 2 received free gym access, had a custom exercise program designed for each member of the group, and also met once a month with an exercise professional. Group 3 was not given access to a gym, but had the monthly meeting. Group 4 received none of the above. They were the control group. The researchers tested all 369 participants before and after the 48 weeks. The tests measured one-rep maxes for chest press, pull-down, and leg press; body-fat percentage; body-fat mass; and lean-body mass (muscle). Overall, and not unexpectedly, Group 2—the ones that received gym access, custom exercises, and guidance—did the best on most measurements. But, there were some surprises, too. Whereas Group 1, the ones with gym access and guidance but no exercise program, reduced their body fat by 0.5 percent, Group 2 lost 2.5 percent. Members of the control group increased their strength by an average of 4.4 percent over 48 weeks, but Group 2 increased theirs by 16 percent. Both Group 1 and Group 2 had free access to a gym, but Group 1 actually lost almost a pound of muscle while Group 2 packed on five more pounds of it. What was surprising about the study was that members of the control group—those who received no help—lost more body-fat mass than any other group and came in second for gains in lean-body mass. And then there was the fact that Group 1 had 48 weeks of free access to a gym and yet lost muscle mass. Members of Group 2 were the only ones to both lose significant body-fat mass and gain significant lean body mass. Regardless of which group they were in, though, most of these 364 previously sedentary adults improved their strength, lost body fat, and gained muscle mass. The researchers noted that the normal procedure for getting sedentary adults on the road to increased activity is to start them on aerobic exercises. Results of this study suggest that if these people got involved in resistance training, they might be in a better position to age more successfully. So, the next time you see one of these lost souls at your gym, direct them to a library of workouts—one of which might be just the thing they need to increase their strength, fight obesity, and maybe even extend their lives! Mann, S., Jimenez, A., Steele, J., Domone, S., Wade, M., & Beedie, C. (2018). 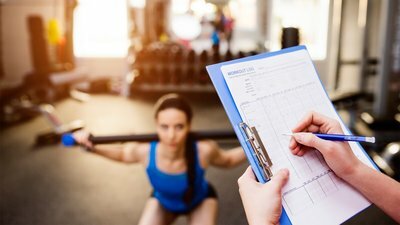 Programming and supervision of resistance training leads to positive effects on strength and body composition: results from two randomised trials of community fitness programmes. BMC Public Health, 18(1), 420.